Geometric design and striking hand embroidery details. Pop-over style with shirttail hem and side slits. Just received this last week. I have another Divya top and it is a keeper. For me (5'3") the length is like a short tunic and covers my middle. I can roll the sleeves up or leave them down. This is a versitel top. Don't see myself coming and going as we have few shopping options where I live. Buying from Marketplace gives me the dual satisfaction of enjoying forward-looking clothes and supporting the efforts of women to succeed economically worldwide. Beautiful, well made. I was impressed with the quality and workmanship. The fabric is so soft and seems wrinkle resistance. The length is flattering. I'm very pleased with my divya top. 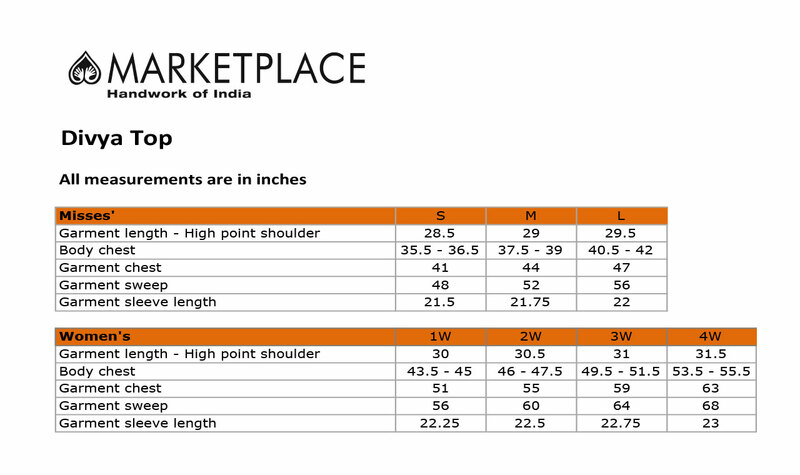 The styling of the Divya Top is very good! I love the fit, the fabric and the combination of the visual textures!